BELLEVILLE, NJ USA – VAC-U-MAX announces exhibition at the 32ndt Annual International Fuel Ethanol Workshop Expo that will be held June 20-23 at the Wisconsin Convention Center in Milwaukee, Wisconsin, exhibiting the latest advancements in industrial vacuum cleaning. Equipment on display includes the MDL 1020MFS Continuous-Duty Industrial Vacuum, Model 40008 Portable Industrial Vacuum for fine, dusty powder applications, and the venturi-driven TK-05, ideal for liquid recovery. VAC-U-MAX offers a full range of air-operated vacuum cleaners for many applications, engineered to address issues of chemical compatibility, flammability, combustibility, and worker exposure to dusts. Product range also includes central vacuum systems for maximum plant filtration and material handling. Additionally, VAC-U-MAX designs and manufactures complete bulk transfer systems for movement of bulk materials from bulk bags / super sacks, drums, and silos. VAC-U-MAX Model 1020 features a powerful positive displacement pump designed specifically for high volume recovery (up to 5 tons per hour). Unit is available in either 10 or 15 HP. As a continuous-duty vacuum producer, unit meets even the toughest clean-up challenges, equipped with a secondary cartridge filter, vacuum relief valve, and a 40-gallon collection container. Unit is easily maneuvered by a single operator. Noise levels are below OSHA standard. VAC-U-MAX Model 40008 is an air-powered industrial vacuum featuring a 30-gallon tank, and pulse-jet filter cleaning for Class II, Division II environments. Unit is completely grounded and bonded, and meets NFPA 70 requirements. VAC-U-MAX air-powered vacuums do not use electricity and do not generate heat, meeting the definition of an “intrinsically safe system”. Unit features a single venturi suction source, manual pulse filter cleaning with air reservoir, and noise muffler for sound levels below 80 dbA. VAC-U-MAX Model TK-05 is ideal for applications requiring high volume liquid recovery, with wet and dry options available as application dictates. Unique design fills 99% of closed top drums at rates of up to 2 gallons per second. Unit features a single venturi, producing maximum suction and air-flow with minimum air consumption. The TK-05 offers a quiet operation, with no motor noise and air exhaust muffled for sound levels within OSHA requirements. Unit is available in carbon or stainless steel construction. Dry-only models are HEPA filtered. VAC-U-MAX designs and manufactures pneumatic conveying components and systems for vacuum conveying, batching, and weighing of powders and bulk materials in the food, pharmaceutical and chemical industries. The primary technology for conveying is vacuum, however VAC-U-MAX also specializes in positive pressure systems as well as mechanical conveying. Additionally, product line also includes mechanical and flexible screw conveying systems, and a full range of portable and central industrial vacuum cleaning systems for high volume dusts, bulk materials, combustible dusts, and liquid recovery. 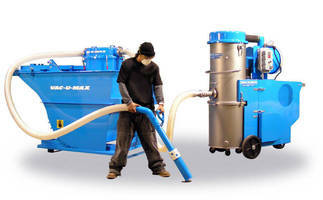 For more information, please visit www.vac-u-max.com or email info@vac-u-max.com.